BONN, Germany, May 9, 2018 (ENS) – “We need to dramatically increase our ambitions. We are witnessing the severe impacts of climate change throughout the world,” said Executive Secretary of UN Climate Change Patricia Espinosa of Brazil, at a news conference in Bonn. “Every credible scientific source is telling us that these impacts will only get worse if we do not address climate change, and it also tells us that our window of time for addressing it is closing very soon,” she warned. Espinosa was speaking at the latest round of United Nations climate change negotiations taking place in Bonn. Talks, which opened April 30 and run through May 10, are focused on developing the operating manual for implementing the landmark 2015 Paris Agreement. The accord aims to keep temperature rises this century well below 2 degrees Celsius as compared with pre-industrial levels. First, all stakeholders, including governments, nongovernmental organizations, businesses, investors and citizens, must accelerate climate action by 2020. Second, she said, the international community must complete the Paris Agreement guidelines, or operating manual, to unleash the potential of the accord. Third, conditions must be improved to enable countries to be more ambitious in determining their own national policies to slow down global warming. At the UN Climate Change Conference (COP23) held last November under the leadership of Fiji, nations agreed to accelerate and complete their work to put in place the guidelines, officially known as the Paris Agreement Work Programme, at COP24 in Katowice, Poland this coming December. At this Bonn meeting, governments are drafting texts to be finalized at COP24. Finishing the operating manual is necessary to assess whether the world is on track to achieve the goals of the Paris Agreement – limiting greenhouse gas emissions, while pursuing efforts to keep the temperature rise to less than 1.5°C. Throughout this year, countries will focus on how they can scale up their climate ambition and implementation in the pre-2020 period. All countries share the view that climate action is essential prior to 2020 when implementation of the Paris Accord begins. Talks focused on the financial support needed to make the Paris Agreement work. By one estimate, the annual un-avoided damages of climate change will cost $50 billion by 2020, growing to $300 billion in 2030. To find ways of increasing resilience to climate change impacts such as floods and droughts, experts and governments are convening May 9 and 10 in Bonn to discuss how successful adaptations in communities and ecosystems can be scaled up and replicated. The meeting is taking place during the UN Climate Change Conference in Bonn as part of the Technical Expert Meetings on Adaptation. It aims to pave the way for global policies, practices and investments to be translated into policy options and actions that meet the needs of vulnerable communities, groups and ecosystems. The event is structured as an opportunity for stakeholders such as intergovernmental organizations, businesses, indigenous communities, cities, regions and nongovernmental organizations to provide input. Because women tend to be greatly affected by climate change while playing a huge role in food production, especially in developing countries, one session will focus on building the adaptive capacity of women. All sessions will produce recommendations to boost support for respecting areas and actions, ease the move from planning to implementation and increase coordination between the national and local levels. In tandem with the event, a Facebook Live event on “Boosting resilience for the most vulnerable” will take place on Thursday, 12.30 CEST on the UNFCCC Facebook account. Michael Bloomberg, the billionaire philanthropist, former Mayor of New York City, and UN Special Envoy for Climate Action, pledged last June to make up the funding shortfall of the Climate Change Secretariat, the UNFCCC. The shortfall was caused by U.S. President Donald Trump’s announced withdrawal from the Paris Agreement on climate change. In late March, the United States Congress announced that it was cutting funding to the UNFCCC for this year by $4.5 million; from $7.5 million, down to $3 million. Bloomberg’s $4.5 million contribution will go towards general operations, including assisting countries to meet targets for cutting greenhouse gas emissions in line with the Paris Accord, agreed by 193 States in the French capital. Bloomberg said he will make additional funds available to the UN Climate Change Secretariat should the U.S. government continue to fail to pay its share of the UN climate budget in 2019. Bloomberg also provided the majority of funding for the U.S. Climate Action pavilion in Bonn, Germany at COP23 when the federal government failed to provide the traditional exhibition space for American climate leadership. At COP 23, Bloomberg and California Governor Jerry Brown launched the phase 1 America’s Pledge report – a footprint analysis of greehouse gas emissions in the United States – and formally submitted it to the UN in place of the federal Nationally Determined Contribution. They plan to release the phase 2 later this year and formally submit it, as well. An important objective of the May session in Bonn is holding the Talanoa Dialogue. The Fiji-led Talanoa Dialogue is facilitated by the UNFCCC Secretariat and will enjoy the presence of high-level officials from Fiji, including Prime Minister Frank Bainimarama, who is the President of COP23. The Pacific island concept of Talanoa was introduced by Fiji, which held the Presidency of the COP23 UN Climate Change Conference. It aims at an inclusive, participatory and transparent dialogue. Traditional in the Pacific region, the purpose of Talanoa is to share stories, build empathy and to make wise decisions for the collective good. The Talanoa method purposely avoids blame and criticism to create a safe space for the exchange of ideas and collective decision-making. The consultative dialogue will check progress, reaffirm the goals of the Paris Agreement and aim to help countries increase their ambition now and in the next round of their voluntary national climate action plans, known as Nationally Determined Contributions. The Talanoa Dialogue made history when countries and non-party stakeholders, including cities, businesses, youth, indigenous peoples, workers, investors and regions, engaged in interactive story-telling around current and future ambitions for the first time. “Rising oceans cause a loss of our habitat, territory and food sovereignty and security. Our indigenous peoples in all regions experience severe storms, droughts and flooding. These events detrimentally affect not only our food sovereignty and security but our very existence, our cultures and identity as indigenous peoples,” said Saldamando. “Defenders of our food security, our ecosystems, territories and cultures, and Sacred Water are criminalized, facing intimidation, imprisonment and assassination. Negotiations have yet to fairly address human rights and the rights of indigenous peoples,” he said. 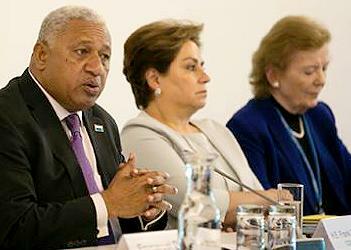 “The Talanoa Dialogue must result in substantially increased pre-2020 ambitions in the mitigation of greenhouse gases. The Dialogue must also provide political momentum for substantially increased ambition for NDCs to be communicated by parties in 2020,” he said. The content of these story-telling conversations will feed into the Talanoa Dialogue’s political phase at COP24. The political phase will bring together government ministers and high-level officials for conversations with a view to generating political momentum to check the warming climate. The World Health Organization <www.who.int>(WHO) has warned that records for extreme weather events are being broken at an unprecedented rate, and that there is a real risk that the planet could lose its capacity to sustain human life if the climate is further altered by adding ever more heat-trapping greenhouse gases. WHO officials expressed the warning while presenting new data at the UN Climate Change Conference in Bonn that shows that nine out of 10 people breathe air containing high levels of pollutants and that around seven million people every year die from exposure to fine particles in polluted air. The figure could be surpassed by deaths caused by rising global temperatures and extreme weather if emissions, primarily caused by the burning of fossil fuels and deforestation, are allowed to rise at their present rate.